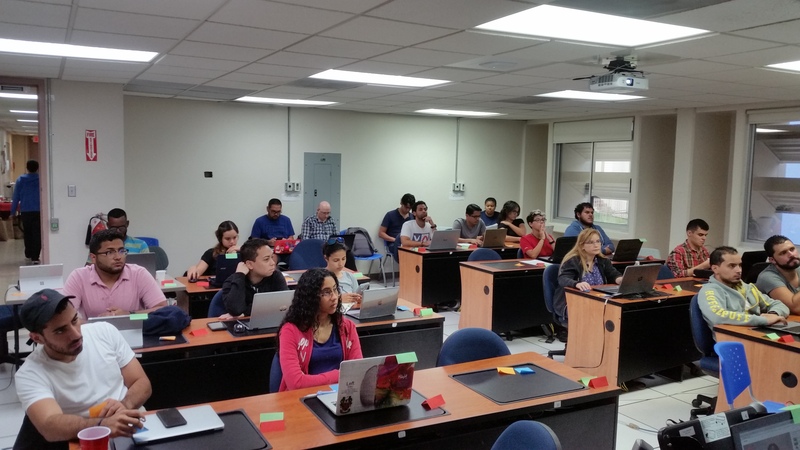 The IDI-BD2K project organized a Data Carpentry Genomics workshop at the University of Puerto Rico Rio Piedras Campus, sponsored by the South Big Data Hub. The workshop was a resounding success with 35 learners registered, and 13 more on a waiting list. Attendees ranged from undergraduate and graduate students to faculty and staff. We need to do more Carpentries workshops! 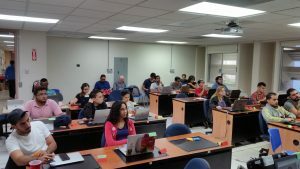 Instructors were Nelly Selem from Mexico and Humberto Ortiz-Zuazaga from Rio Piedras, and a group of volunteer helpers: Eveliz Peguero, Sebastian Cruz, Israel Dilán, Abraham Avelar, and Kevin Legarreta Gonzalez. 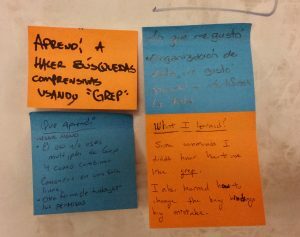 Carpentry workshops teach foundational coding and data science skills to researchers, so they are a great match for IDI-BD2K’s goal of creating diverse teams of scientists looking at turning biological data into biomedical knowledge. Participants learned how to manipulate next generation sequencing data to see variants in a population of E. coli. To do this, they used cloud computing resources, logged in remotely, processed files on the command line, and wrote scripts to automate parts of the analysis. 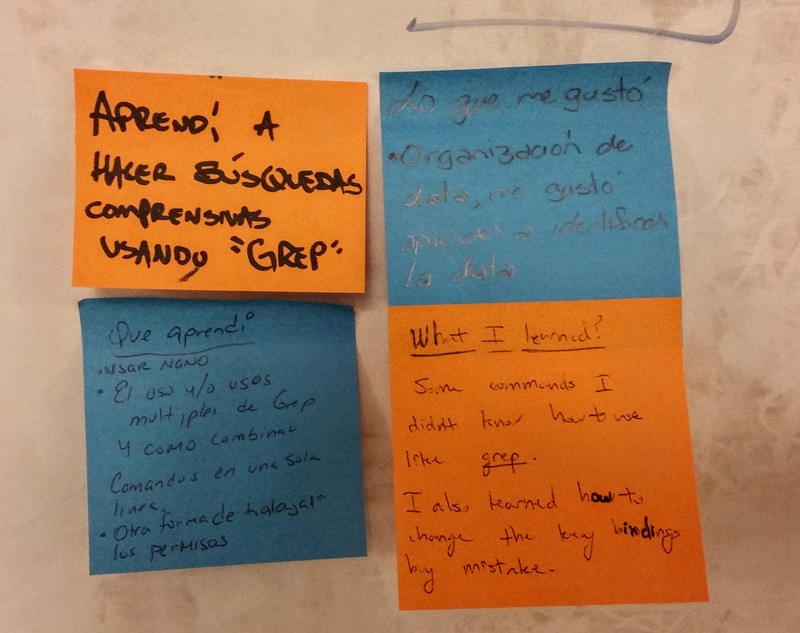 What I learned at the workshop. The Carpentries also disseminate best practices on teaching in STEM, as informed by research and the instructor’s experience. The green and red papers on learners desks or laptops are one example. Learners are asked to place the green paper on their laptop if they complete an exercise, and a red one if they get stuck. 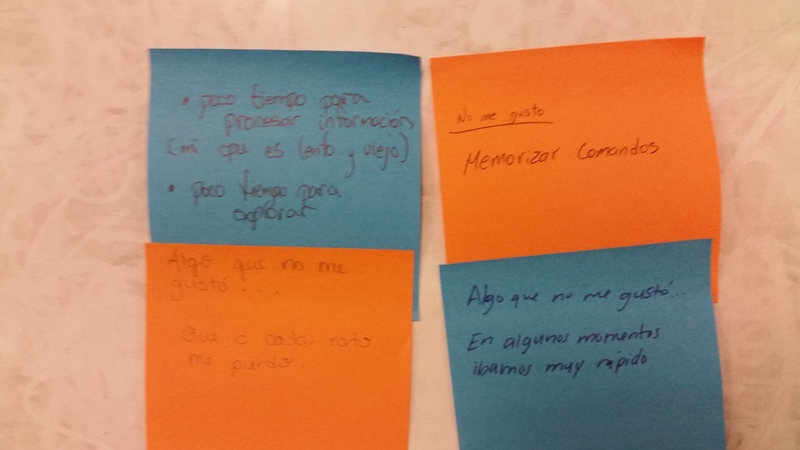 This feedback helps maintain an appropriate pace for the workshop. I forgot to use the stickies the first day of the workshop, and at times we went too fast. One thing I didn’t like about the first day of the workshop.